optimal either. It doesn’t raise enough money in the long term and it feeds the fiction that middle-class taxes will never have to go up. The best option is to let everything expire, and then pass a new tax cut that phases out over time. 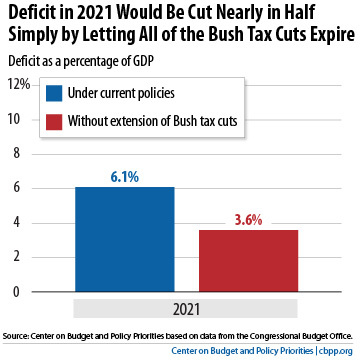 The new tax cut might be a reduction in rates equal to the Bush tax cuts, or it might be some other set of reductions. It doesn’t matter very much. What does matter is that one-quarter of the cuts should expire in 2014, another quarter in 2015, another in 2016, and another in 2017. This would have a gradual effect on the economy, it would require no further congressional action, it would improve our medium-term deficit problem, it would take effect primarily while the economy is recovering, and it would do no more than eventually return us to the tax levels of the Clinton era. There are more complicated approaches you could think of—tagging the expiration dates to economic benchmarks, for example—but in this case, simpler is better. Just phase out the cut over four years and be done with it. That’s easy for people to plan for. So why won’t this happen? Because there’s no constituency for it. Republicans won’t get behind it because they want permanent tax cuts. Obama won’t get behind it because it’s effectively a tax increase on the middle class, something he’s promised to oppose. Independents might get behind it, but their political influence is approximately zero. So that’s the situation we’re in. The best solution is probably the least likely to be enacted. Welcome to Washington.